DAVID BOWIE released over thirty albums throughout his fifty years in the music industry, including The Man Who Sold The World, Space Oddity, The Rise and Fall of Ziggy Stardust, Aladdin Sane, Diamond Dogs, Station to Station, Young Americans; Low and Heroes with Brian Eno and Tony Visconti; Outside, with Eno, Heathen, and The Next Day, which was critically lauded across the world, and in 2014 the compilation Nothing Has Changed. His final album Blackstar was released in January this year. 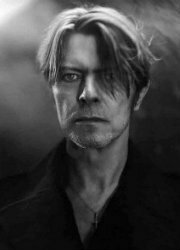 As an actor, Bowie appeared on Broadway in The Elephant Man, and can be seen in the films The Prestige, directed by Christopher Nolan, as well as Nicolas Roeg’s The Man who Fell To Earth, Martin Scorsese’s The Last Temptation Of Christ, Tony Scott’s The Hunger and Nagisa Oshima’s Merry Christmas Mr Lawrence. In 2007, Bowie starred as himself in an acclaimed episode of “Extras,” Ricky Gervais’ series on HBO. In 1996, Bowie was inducted into the Rock and Roll Hall of Fame, and in 1999, he became a Commandeur dans L'Ordre des Arts et des Lettres.